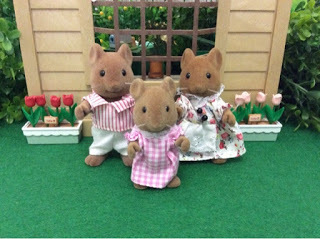 Dear Sylvanian fans, I can't believe it has been more than a month since I last blogged. Time has flown by, just like it usually does this time of the year. 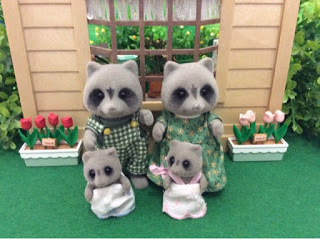 Sylvanian wise not much has happened in Sugarbush Valley. The villagers go about their daily tasks and I'm trying to get my motivation back to play with them and tell new stories. Unfortunately, nothing! Very frustrating, I know! Some would think me mad to choose families as the first step in getting my motivation back, but I'm standing by my original collecting objective of giving a home to each family living in SV, and that is just too difficult with 50+ families. Even the approach that I tried a few months ago of giving fictional houses to families, still didn't satisfy me, so with this four families moving away I have three less 'house-less' families and an extra house. After deciding on the families, the tough process of getting new homes in other villages for them started. Three of the families were easy, but the last one remains a challenge (more about that in a minute). The first family that were picked up were the Hazelwoods, Basil and his family, is already off to the wonderful magical village of Marigold Creek. They are still in 'transit', but I hope to hear from them soon. Finding a new village for the Chestnuts was a no brainer, I knew that Rooibosch Hill would be perfect for them, so they were off. As Rooibosch Hill is very close to Sugarbush Valley, I'm happy to tell you that they already arrived safely, and are settling in nicely. The final 2 families that will be leaving Sugarbush Valley is the Puddleford family and the Furbanks family. The only problem is I don't know where to send them. So I have came up with a brilliant idea... "A GIVEAWAY"
I think it is perfect timing with Christmas just around the corner. 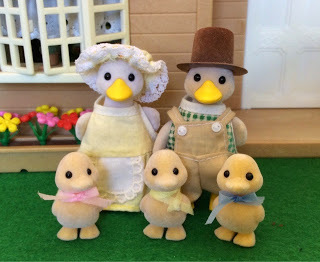 So this is how it will work: in the comment section of this post (or reply to the post in the forum) write a short paragraph of why the Puddlefords or Furbanks should come and live in your village. Entries will close Sunday 11 December 2016 and I will announce the winner on Monday. Though the Puddlefords and Furbanks (FYI - little Alfie will remain in my collection and I have a plan for him and big sister Alyssa already) were never two of my favorite families, I still like them very much and they are very close to my heart, so I will be biased as to were they will go. So the better your motivation, the bigger chance you have of convincing me. That is all for today, and I'm still hoping for a story before the end of 2016.